This week in preparation for the winter Olympics we’ve pulled this drill from our archives. Enjoy! 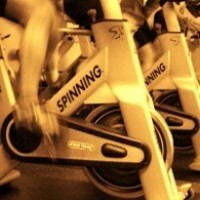 I’ve been coaching this pedal stroke drill for almost as long as I’ve been teaching indoor cycling (which is 20 years). I first introduced it at a conference as a master instructor in my session called The Anatomy of the Pedal Stroke at WSSC (World Spinning® and Sports Conference) in 2002. It’s called the Olympic Rings. The purpose is to get riders to visualize their pedal strokes and connect to the drivetrain of the bike. It’s a fabulous visual to smooth out their pedaling. While it’s timely right now during the Rio Olympics, it’s something you can do at any time. I would make sure your riders have already mastered the basics of the pedal stroke with this drill first. You can use the Olympic Rings to augment the other visuals you use, such as this one. Drills like this are especially useful during the warm-ups for endurance or tempo-paced profiles. Occasionally I will devote an entire class just to focusing on pedal strokes. That’s when you will want several different drills to keep participants engaged.